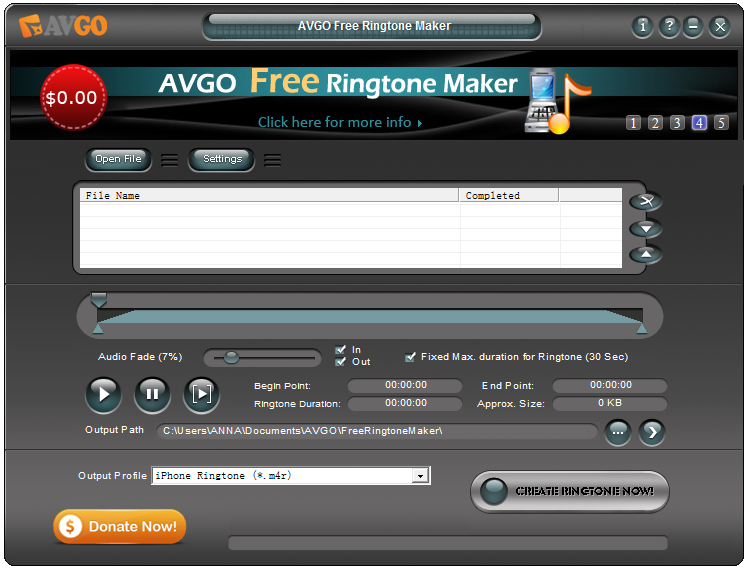 AVGO Free Ringtone Maker is a free software that lets you create your own ringtone from almost any audio or video file format. It is a fun and entertaining tool which will definitely bring outthe musical genius in you. AVGO Free Ringtone Maker has an easy to use interface that allows you to clip a portion of the audio from your favorite audio or video files as input, such as .mp3, .m4a, .wav, .wma, .avi, .flv (YouTube Format), .mp4 (iPod Video Format), .wmv, .mkv, .rm, .ra, .mov, DivX, XviD, 3GP, etc. and then convert it to ringtone format compatible with iPhone, Samsung mobile, Nokia mobile and more. It also supports batch conversion and audio effect such as fade in and fade out. Why settle for the ordinary when you can be unique? Be heard and dare to be different, customize your ringtone and standout among the crowd! Download AVGO Free Ringtone Maker now and start creating your own ringtone for free. If you enjoyed using the Free Ringtone Maker and you would like us to continue on improving the software, you may send us your suggestions and we would be very happy to take it into consideration for future updates. You may also help us in our advocacy of providing free useful software by sharing your blessings with us. I would recommend. Really good program. It's Fabulous! Nice Working . keep it up! This is the best Ringtone Maker I used ever! Thank AVGO! Happy to introduce this useful application to our readers..
Free DVD Video Software , USA 5.0 5.0 7 7 I would recommend. Really good program.